An Emu Heights man who paraglides to work in the Penrith CBD each day says it saves time and money – and he’s encouraging other locals to follow in his footsteps. Richard Butterworth, 56, first came up with the idea after sitting in traffic for up to half an hour each day just trying to get from Emu Heights to his job at Penrith. “Suddenly the light bulb went off – I could avoid using the car altogether and take advantage of my suburb’s very name,” he told the Weekender. Mr Butterworth has now built a special deck at his property, which allows for easier take-offs each morning. “Wind is obviously a significant factor but most mornings I land pretty close to the Penrith Council car park, which is right near my work,” he said. Thankfully Mr Butterworth’s wife works nearby, and the two car pool back home of an evening. 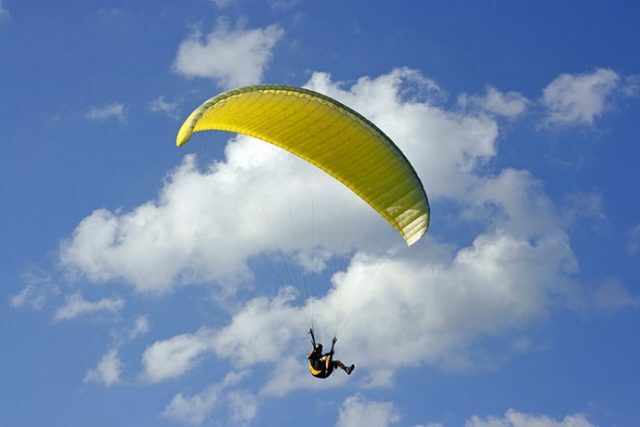 “My wife thinks I’m crazy but paragliding to work is an amazing experience and I’d encourage others to do the same, especially those in the lower Mountains as there is a natural slope and direction to follow,” he said. Editor’s Note: Yes, this is an April Fools Day story!